How Do Teeth Stimulate Bone? When we talk about teeth, it’s important that we talk about the entire overall tooth structure, which includes the root. The root serves many functions, including blood flow and bone stimulation, two functions that dramatically diminish as soon as a tooth is extracted. But what does that have to do with bone loss? Tooth roots work to stimulate alveolar bone, a sac-like organic material which surrounds the roots of all teeth. Along with the root, this bone is responsible for keeping teeth in place and providing a strong foundation for everyday use. Furthermore, the alveolar bone is regularly being stimulated by chewing, grinding and other necessary functions transmitted through teeth. When teeth are lost, this stimulation ends, effectively allowing the alveolar bone to shrink. This eventually causes the basal bone (also known as the jawbone) to begin shrinking as well, resulting in catastrophic effects on your oral functions. What Happens After a Tooth is Extracted? How Can I Prevent Bone Loss? In the past, dentists and researchers had no answer for true tooth replacement. 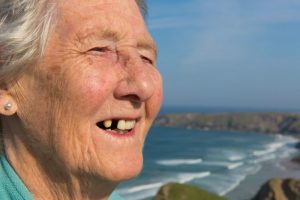 Dentures and bridges only addressed the crown portion, not the bone and gum tissue underneath, meaning bone would resorb and the jaw would shrink regardless. But now, dentists can place dental implants, which act as a two-step, long-term solution to tooth loss. Dental implants replace the roots of teeth as well as the crown, therefore solving the underlying consequences of tooth loss and not just improving your smile’s appearance. They stimulate bone, which prevents shrinking of the jaw and replicates the same chewing and grinding functions of natural teeth. They fuse naturally to organic material, have 10-year success rates as high as 98 percent on average, and don’t require any special maintenance to keep healthy. If you’re trying to find the best solution to tooth loss to date, schedule an appointment to learn more about dental implants in Estero today! Dr. Rich Gilbert earned his DMD degree from the University of Florida College of Dentistry. He holds a Fellowship in Implant Dentistry and is fully capable of planning, placing and restoring teeth entirely at his office. To learn more, you can contact him through his website.